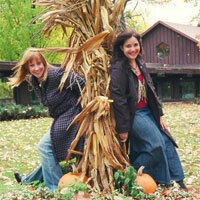 About The Artist: Erin Lee & Marci met while doing improvisational children’s theater in 1999. They quickly became friends and began collaborating as performers and educators. They have since performed all around New York City for both adults and children alike, as a duo and as part of larger theater shows. They spent a number of years co-teaching a theater program for elementary school students for whom much of their music was originally created. Realizing the need for songs both funny and thoughtful that reflected a child’s everyday life, they began writing. The results are their debut CD Someone’s Gotta Wanna Play which was awarded Best Recording for Younger Children, 2005 by the Children’s Music Web, and Snowdance which was debuted on Rosie O’Donnell’s R Family Cruise to Alaska and went on to win two ASCAP Awards for excellence in writing and the Family Choice Award. Erin Lee & Marci have both served on the Children’s Music Network Board of Directors.